Sugar addiction is used to describe a situation where a person has developed a very strong craving for foods that taste sweet and finds it very difficult to give them up.They will also find it hard to lose belly fat. There are many people who are addicted to sugar and yet they are not aware of it. Lets look at what really happens. If you are addicted to sugar you will experience what other addicts normally experience. Firstly you will notice that foods or drinks that contain large amounts of sugar tend to take a large fraction of your diet. Secondly you will have a habit to consume foods or drinks with sugar very frequently. If for some reasons you do not consume these foods or drinks for a while you feel low, irritable, frustrated, experience panic and sugar cravings followed by fine tremors, headaches and a pre-occupation with eating sugary foods. Furthermore if you take sugary foods you feel very satisfied immediately. If this describes you then most likely you have sugar addiction. Breaking sugar addiction is not easy. It requires a lot of effort.If you are a sugar addict, you will most likely be struggling to reduce weight.Sugar is among carbohydrate addicts foods and it is one of the simple carbohydrates. Just like sugar there are people with carbohydrate addiction. Many people with carbohydrate addiction have inquired if there was a way to dissolve belly fat because they have an ever increasing belly. It will be very difficult to lose weight or reduce belly fat. With carbohydrate addiction you have a gradual increase in body weight.According to the World Health Organization(WHO) we should take less than ten percent of the calories we need per day in form of sugar. If you take 2500 calories per day, you should not take more than 250 calories from sugar. Pop is the most common source of sugar, which you might easily take without much thought.A 355 ml pop-can could have 48 grams of simple carbohydrates. If you want to know the equivalent number of spoons in this drink you can divide 48 by 4 to obtain 12 teaspoons of sugar. Just like WHO the US Department of Agriculture recommendations are pretty close. It recommends that you limit the amount of sugar you consume to not more than 12 teaspoons of sugar each day (if your caloric intake is 2200). The calories you take will depend on your daily average caloric intake. If you take 2 cans of pop per day you are taking far too much sugar and may cause you to start getting a fat belly. some people think they could win over belly fat with dieting without changing the sugar intake. 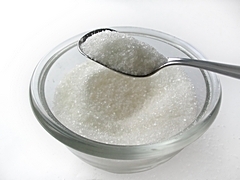 This is very difficult to do as most of the refined sugar in a sedentary person is converted to fat.The common sources of sugar that most people will take without much thought include sodas, coffee and tea with added sugar. Most of the common soft drinks contain approximately nine to 12 teaspoons of sugar per 355 ml can. As mentioned above foods that contain a lot of refined sugar make it difficult for overweight or obese people to to lose weight. Sugar can cause a decrease in your insulin sensitivity thereby causing an abnormally high insulin levels and eventually diabetes. Many people who genuinely want to be slim are not aware that they consume excessive quantities of this substance. Sugar is added into almost all convenience foods that we buy. Even natural foods such as oranges, apples tomatoes and many others considered as healthy foods contain some sugar. However these are not refined sugars and they exist in combination with other substances collectively called simple carbohydrates. Your body can process them without experiencing the damage caused by refined sugars. If you want to quit sugar addiction you will have to make important changes in your normal life. You will have to give up a lot of processed foods containing simple carbohydrates. Some of them are described below. You do not have to worry about the sugar in natural foods provided you do not overeat them. Natural sugars such as lactose or fructose that may be found in your diet may be required to maintain a healthy life. Your breakfast should contain an optimum proportion of carbohydrate foods such as oats or wholemeal flour to help you maintain constant levels of blood sugar levels. This also helps to reduce your craving for sweet snacks. To keep everything working well you will need to remain active by either doing resistance exercise,running for weight loss,performing aerobics or walking. Do not forget to drink a lot of water. This will help in the regulation of blood sugars. As you decrease the amount of processed sugars that you eat you will be doing yourself a great favour. Your general health will improve. Probably this could even make you live longer.